Teeth whitening, for a storybook wedding, an important job interview, a graduation, or easing a lifetime of embarrassment – our patients each have their own special reason for whitening their teeth. Teeth whitening is used to brighten the natural color of the tooth enamel, and it is an easy, non-invasive way to improve the appearance and beauty of your smile. Fortunately, professional teeth whitening is an incredibly effective way to lighten or altogether eliminate stains and achieve a naturally white smile. Today, you have more whitening options than ever before. There are many over-the-counter products to choose from, but professional, dentist-supervised treatment is safer, and offers better results. Before beginning a tooth whitening regimen, it’s important to determine if any fillings, crowns or other restorations need to be replaced, as tooth whitening only works on the natural tooth enamel. This replacement will be done after the bleaching, so your new fillings will match the new color of your teeth. I want my teeth to be a little bit whiter. Touch ups every several years are necessary to keep your teeth looking white. People who smoke, or drink coffee, tea, or wine will need touch ups more frequently. The KöR® Whitening Deep Bleaching™ System is comprised of an at-home and in-office component. We will create customized trays for you to wear for at-home treatment during a two-week period. Afterwards, a conclusive follow-up treatment will be conducted at our office. The KöR® Whitening Deep Bleaching™ System is designed to treat even the deepest, most difficult-to-remove stains, with long-lasting results. The system is also designed to significantly minimize the sensitivity that is commonly associated with other whitening procedures. With continued at-home maintenance, KöR® Whitening can keep your teeth looking great for years to come. Click here for your KöR® take-home instructions. 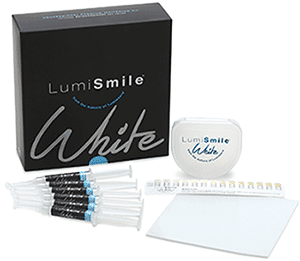 For a high quality whitening product at an affordable price, LumiSmile White is your best answer. Available in 32%, 22% and 16% carbamide peroxide formulations, LumiSmile White includes peppermint oil for flavoring. The whitening gel includes propylene glycol to minimize dehydration of the teeth, and additional water and potassium nitrate is added to increase patient comfort. During your initial two-week treatments at home, you will wear trays that are customized to be thin and form-fitting. These trays are worn while you sleep, and because of their design, the whitening gel is sealed in, avoiding leakage. The gel is formulated to boost the teeth’s ability to absorb oxygen. The oxygen in the gel is then absorbed by the teeth, effectively removing stains and revealing whiter teeth.